it's always fun to show your city to someone who's never visited it before. that's one of the reasons why i'm looking so much forward to blog camp. an old friend of mine put me in contact this past week with a friend of hers who was going to be in town. being a brave and daring and outgoing american (something i once, in the distant past, remember being myself), her friend did indeed get in touch with me and we made plans to meet today in copenhagen. check out that fun sign she's standing next to. sense of humor. rad very cool pilgrim sunglasses (on sale in illum). cute purple coat with matching shopping bag (containing awesome shoes) from illum. seriously, what more could you ask? we had an awesome day, biking around copenhagen (her hotel had bikes and i brought mine), doing a bit of shopping (light yellow converse all stars do indeed exist, but there were too many people and i didn't want to wait to see if they had them in my size, because we only had a limited amount of time, but i shall go back.) we had lunch at nyhavn, we saw the mermaid (keyword: little), we climbed the round tower. it was lovely and i was reminded, once again, through the eyes of another, that copenhagen is indeed wonderful. See? She wanted to see the mermaid too... All is well if she is a blogger! sounds like an excellent day! don't you have shoes that would be smashing with that purple coat? i know . . . you're holding out for the chucks. i don't blame you. mermaid? what mermaid? i have a fascination with mermaids lately. B--we're going there, don't worry! janet--i only wish that was my purple coat. :-) and the little mermaid of H.C. Andersen (look, me using caps) fame via Disney and a major tourist attraction (despite its diminutive size) in copenhagen. That is a fabulous purple coat. Sounds like it was a good visit. Do I need to bring you some Chuck's when i come to Copenhagen? it's peaceful to read about your visit. 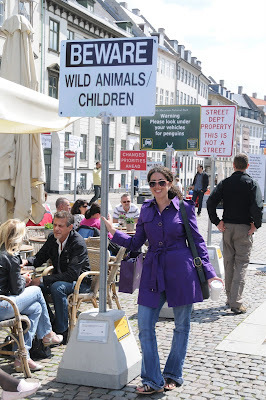 This post brings it all back - Copenhagen for two visits in my college days - all too brief. I remember finding a street sign that was the same as my mother's maiden name - wondering if we had some illustrious Danish roots. There was some kind of amusement park (Tivoli?) where my college buddy and I were flirted with rather aggressively. Ah, the days! isn't it great meeting new people that you can connect with? I have to admit, I had high hopes for the gruesome angle. Nothing macabre ever happens in the blogosphere. Well, there's always tomorrow. And blog camp. Mellow as ever, just kind of desperate for some outside excitement. Finnish sushi doesn't even come with parasites... Boring raw stuff. Even the VW words are old ones I've already written down. Julochka and Extranjera: Axes can be packed in your suitcase, just not handluggage. Oh, I'm sorry. Is this something I shouldn't have mentioned? You're funny! I love reading your posts by the way! Ok...did I miss something? I don't recall any mention of the big octopus arms coming out of the building? Was I asleep? Drunk? Under a rock? Hmmmm. must reread I guess. And I'm glad she didn't make you dead. My whole cyber world would have imploded. bambi- only mention of dragon tails is in the labels. I too share a natural suspicion of Real Life People rather than knit-your-own-internet-buddies. Loving her drunk ramblings, so funny. And I need her coat, and her glasses. And probably the shoes too. Grr. Plans are afoot for Famille Spud to visit Scandanavia. We recently moved to the East Coast of England, and have ready access to vomit inducing ferries over your way. Will you be my guide and make me buy cool shoes? That building is bizarre, very quirky. How fun... love that sign and the dragon tails are cool. We have a SF version of that but they're legs, on Haight Street. what fun!!! :) she looks totally rad and cool. Looks like a really fun day! Cute sign and dragon tails. In England, there's a trompe l'oeil building, where the upper floors appear to move away from the building, while you're watching. Hope you have fun at your blog camp! I don't know what's funnier-- The dragon or the George Bush sign! Very fun post. Thanks for shaing! Street Dept Property. This Is Not A Stree!t.